Bangladesh Inland Water Transport Authority (BIWTA) is digging up around 12 acres land of the river Turag to ensure water flow of the river at Bosila point in the capital’s Mohammadpur. The BIWTA recovered the land from the illegal possession of Amin Momin Housing on February 14. 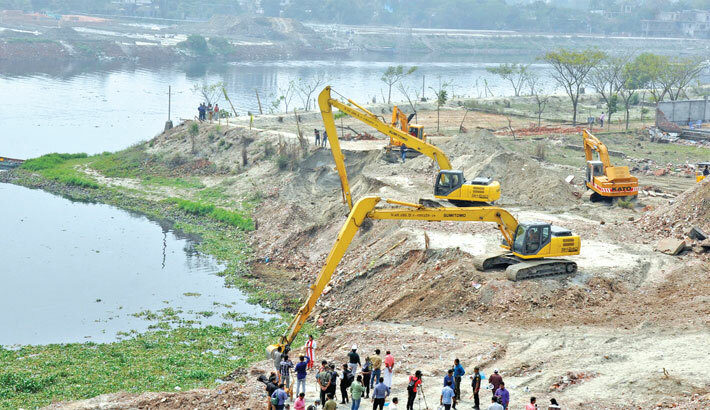 Grabbing the sizeable portion of the river near Uttarpara area in Mohammadpur, the housing company filled up the area with mud and sand and built establishments, but mud and sand will be removed from the channel of the river, said BIWTA officials. During the demolition drive on February 14, a BIWTA team bulldozed a number of structures built by the housing company. At the beginning of the drive, some lawyers of the housing company turned up at the scene and talked to journalists. But they could not show any valid document in favour of them during the demolition drive, officials said, adding that the area was once the channel of the river Turag. Later, BIWTA detained a man named Awalad who faked her identity as a legal adviser to the housing company and tried to create obstruction during the drive. “We want to send a warning massage to the giant housing companies, which have occupied river land and established illegal strictures there. We will also dig up the grabbed portions of the rivers,” Arif said. Four excavators and a veku machine are now being used to remove soil from the area while five more excavators will be brought to the scene soon, said Shofiqul Haq, director of BIWTA (port).